“I achieved my goal of breeding more cockroaches with less effort and smells. If you want to save money, this book is a must for every reptile owner”. Like many reptile keepers I breed cockroaches as they are relatively easy to breed and save me money. With the success of my cricket colony using “The Complete Cricket Breeding Manual” (see review above), I also purchased “The Complete Cockroach Breeding Manual”. The main goal was to produce more cockroaches with less effort and smells. Both books have hundreds of color photos and very clear instructions, so the making process was again straight forward. All the materials I was able to source from my local hardware. 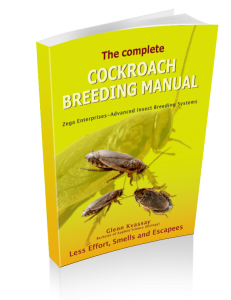 The book has a number of methods which makes managing and breeding cockroaches easier. My cleaning has been streamlined and the automated food and water dispensers make the whole process much easier. The books 9 chapters cover every aspect of cockroach breeding, and again the photos really make the process really easy to understand. I started with just a few containers, but plan to expand to 16 or more containers now the cleaning and feeding is streamlined. I am very happy with my purchase, its methods are saving me thousands of dollars a year. The author is really approachable, so I have no problems contacting him with questions by phone, email or Skype. In summary I would say this book is not a literature review of existing methods, it is a complete overhaul. I achieved my goal of breeding more cockroaches with less effort and smells. If you want to save money, this book is a must for every reptile owner.